Salt Lake City, Utah -- October 15, 2018 -- On the heels of its recent $25 million Series B funding, led by Accel, RiskRecon today announced two key hires: Kim Ann King, who will serve as Vice President of Marketing, and Jon Whitlock, who will serve as Director of Partner Programs. 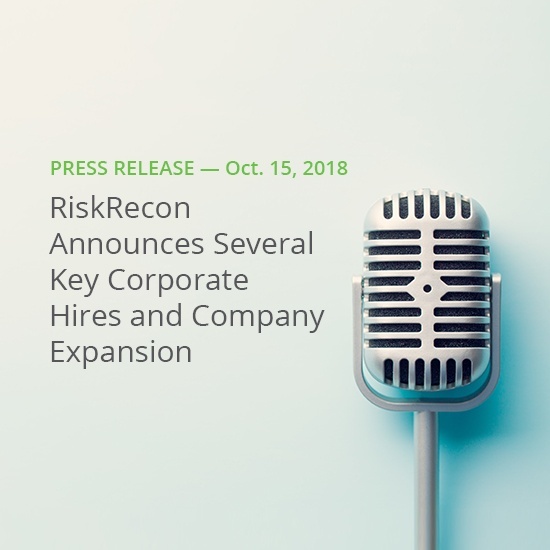 RiskRecon has also opened a second office in Utah to accommodate the company’s growing operations, development, and marketing staff. King, a veteran of the Boston start-up scene, has helped to successfully launch and grow several organizations, including Open Market (formerly on Nasdaq as OMKT), Akamai Technologies (Nasdaq: AKAM), and Bit9, now known as Carbon Black (Nasdaq: CBLK). She is the author of “The Complete Guide to B2B Marketing: New Tools, Tactics, and Techniques to Compete in the Digital Economy,” published by Pearson Financial Times Press in May 2015. Whitlock brings extensive channel development and alliances experience working with software and cybersecurity companies, SIs, VARs and MSSPs. He recently led Carbonite’s global channel sales and programs and prior to that, built and managed Kaspersky Lab’s North America channels. He has also actively participated on several channel advisory boards and councils, including CompTIA, Baptie, HP, and Microsoft.